In William Faulkner’s story “Barn Burning,” a boy struggles between family loyalty and doing the right thing. His sharecropper father, a charming fellow, takes out his frustrations with his landlords by burning down their barns. The son, Sarty, learned his image of manhood from this father and stands prepared to lie for the man in the court case that opens the story, yet he somehow knows that this is not the proper way to reconcile differences. How does a boy, growing up under the tutelage of a wicked man, learn to embrace righteousness and hate wickedness? According to Romans, those who live without the law still have the law written on their hearts. They know. Young Sarty knows, despite the natural bonds of familial loyalty that tell him otherwise. Within each human being, two forces wrestle for control. 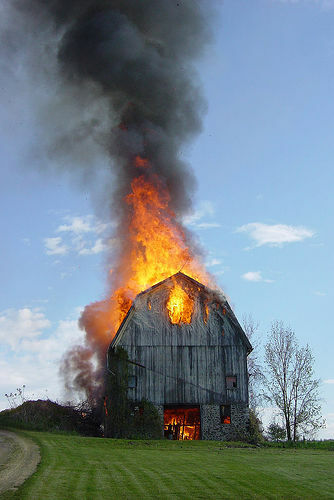 The forces of righteousness seek to build up the barn, while the forces of wickedness or sin seek to steal, kill, and destroy, to burn down the barn. Few, if any, people live utterly wicked lives, lives with no redeeming features. Certainly none of us lives utter virtuous lives, lives where the love of righteousness has managed to triumph utterly over its adversary. Such a person would be justified by the law, and we’ve seen clearly in Paul’s writing that no one finds justification through the law. In this introductory passage to Hebrews, the author seeks to set Jesus apart from all other beings in the universe. Jesus is not chief among the angels, nor is he just another man. He is simultaneously God and man, and as such, he managed to perfectly love righteousness and hate wickedness. You and I will never manage to equal his zeal in those pursuits, but our proper response is to try.